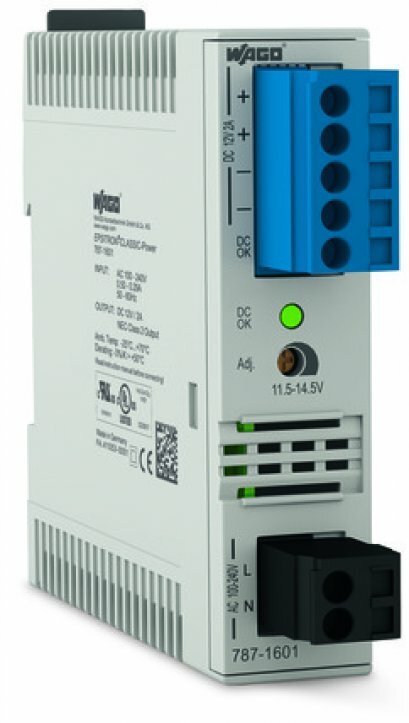 Compact, high-performance power supply in DIN-rail mount enclosure. Low-profile, single-phase power supplies with wide input voltage range, as well as 12V and 24V output voltages. Installation depth is often restricted for both building and industrial applications. DIN 43880 specifies built-in equipment dimensions for installation in distribution and meter boards. COMPACT Power Supplies meet these requirements with a height of just 55mm from upper-edge of carrier rail – width and profile also comply to this standard. 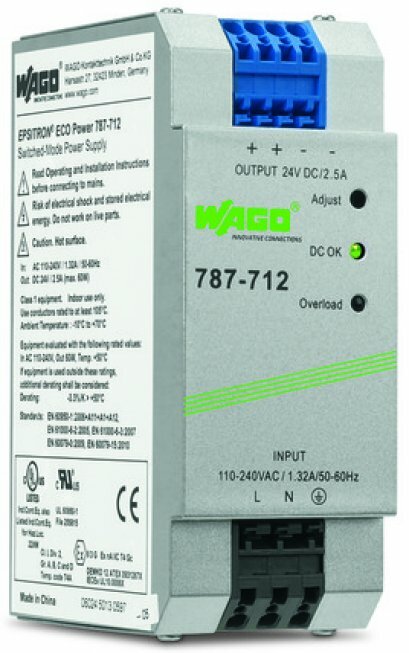 WAGO's compact but powerful 787-10xx Power Supplies (30W, 60W and 100W) provide 12 and 24VDC output voltage. Front-panel status indication, maintenance-free CAGE CLAMP® connection, adjustable output voltage, constant current operation in case of overload, as well as overhead installation capability are only some of the benefits. 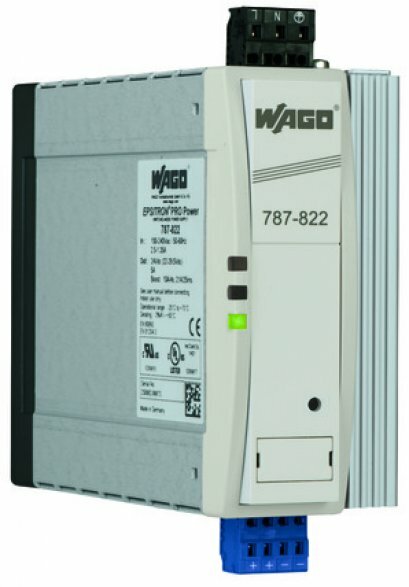 Thus, WAGO's COMPACT Power Supplies allow distributed control systems to be supplied in flat distribution boxes or operator panels. All COMPACT Power Supplies indicate output voltage availability via green LED. This allows current operating status to be displayed at a glance. 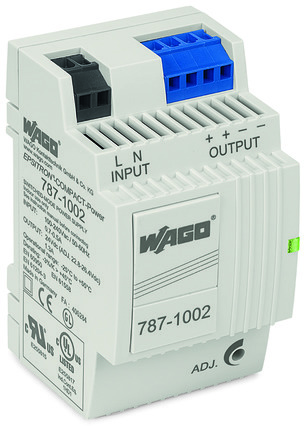 To supply capacitive loads (e.g., distributed control units or HMI devices) with higher inrush current, WAGO's COMPACT Power Supplies feature constant current characteristic, while delivering 1.1 times the nominal rated current during overload. For low-ohm short circuits, the output voltage is reduced to zero and automatically reinstated once the short-circuit has been eliminated. The wide range of input voltages for COMPACT Power Supplies allows feeds of 85 to 264VAC — devices can operate on different supply networks in Europe, America or Asia without additional conversion or setting. This feature increases tolerance of voltage fluctuations within a supply network, increasing reliability.